In the heated climate of today’s discussions on attention deficit hyperactivity disorder (ADHD), one of the areas we sometimes lose sight of is the history of this disorder. Although frequently discussed in the context of our fast-paced, high-tech modern lives, the symptoms of ADHD are by no means unique to our time. Fidgety Phil, often seen as an allegory for ADHD. Illustration from a book written in 1846 by physician Heinrich Hoffmann. Courtesy of Project Gutenberg. An ADHD-like disorder was actually described as early as 1798, by Scottish physician Sir Alexander Crichton. Writing a chapter “On Attention and its Diseases” in a three-book series entitled “An inquiry into the nature and origin of mental derangement,” Crichton spoke of a disease characterized by difficulty sustaining focus, a predisposition to distraction, restlessness, and possibly some type of impulsivity—highly reminiscent of the current DSM definition of ADHD (although lacking the hyperactivity component). Crichton even recognized the developmental nature of the disorder and understood that it might be due to neurological dysfunction. Ever hear the tale of Fidgety Phil, the young boy who couldn’t sit still at dinner? He wriggles and giggles and infuriates his parents by tilting his chair and tugging at the tablecloth until the whole meal comes crashing down. 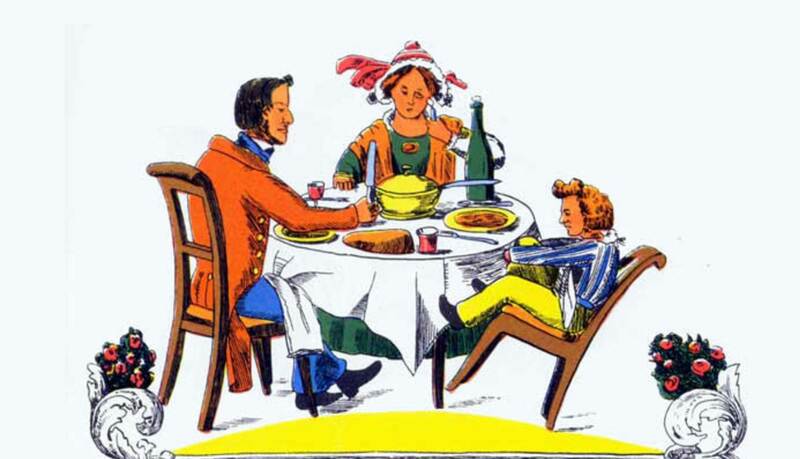 The story was written and illustrated by German physician Heinrich Hoffmann in 1846, as part of Struwwelpeter, a book of “merry stories and funny pictures” given to his three-year-old son on Christmas. Eventually, Struwwelpeter was translated into over 30 languages, and Fidgety Phil became an allegory for ADHD. While Hoffman makes no mention of mental disorders in the children’s book, and his most immediate purpose was probably to amuse his son, his varied stories of misbehaving children were linked to mental disorders because he was the founder of an innovative mental hospital in Frankfurt. Also, he was known for trying to improve public perceptions of the mentally ill, and for using illustrations to reach his youngest patients. To demonstrate that ADHD is not a new problem, researchers have even gone as far matching line-by-line analyses of Fidgety Phil with symptomology in the DSM. Unfortunately, we don’t have Hoffman around to question and determine if we’re reading too much into his stories. At the very least, though, I think Fidgety Phil demonstrates the existence of ADHD-like behavioral problems 165 years ago, in a society very different from our own, with no TVs, iPods, or video games to blame. I like Bradley’s story because it’s a classic example of how the biggest discoveries in science happen by accident. In 1932, Charles Bradley became the medical director of a small hospital in Rhode Island for children with learning and behavior problems. The hospital was named after his cousin Emma, who had a neurological disorder, and founded just a year before by his great-uncle (Emma’s dad). Bradley was known for being conscientious, always performing thorough work-ups on each patient. These work-ups included a spinal tap, which often caused bad headaches. To deal with this side effect, Bradley wanted to stimulate the choroid plexus (structure in ventricles of brain that makes cerebrospinal fluid). Bradley began a small clinical trial in his hospital, involving 30 children. About half showed strong improvements with Benzedrine, and the results were published prominently in 1937. Bradley commented on the paradox, still discussed today, of successfully treating hyperactivity with stimulant medication. He also wisely observed that “portions of the higher levels of the central nervous system have inhibition as their function, and that stimulation of these portions might indeed produce the clinical picture of reduced activity through increased voluntary control”—in other words, the drug might be stimulating inhibitory systems in the brain that are designed to keep our impulsive or hyperactive tendencies in check. Unfortunately, for decades Bradley’s findings didn’t go far in terms of changing the treatment landscape. Finally, in the 1950s and 60s, Bradley’s research was re-visited. Based on the Benzedrine data, new stimulants such as Ritalin (methylphenidate) entered the marketplace. Leandro Panizzon was the chemist who synthesized methylphenidate. While originally prescribed for conditions other than ADHD—such as depression, senile behavior, lethargy and narcolepsy—methylphenidate is now one of the most commonly prescribed (and hotly debated) treatments for ADHD in the United States, with over 10 million scripts filled each year. While there’s a lot left to discover about how Ritalin works, it is known that Ritalin binds to molecules in the brain that shuttle the neurotransmitters dopamine and norepinephrine out of synapses—the sites of communication between neurons. By binding to dopamine or norepinephrine transporters, methylphenidate prevents the reuptake of these chemicals into neurons and increases their concentration within synapses. This is important because dysfunction in the dopamine and norepinephrine systems is thought to play a key role in the pathology of ADHD. I’m curious what Leandro did after synthesizing methylphenidate, but he seems to have kept a low profile. If anyone knows of a good book or article on this topic, please share by submitting a comment. Taylor E. Antecedents of ADHD: a historical account of diagnostic concepts. Atten Defic Hyperact Disord. 2011. Lange KW, et al. The history of attention deficit hyperactivity disorder. Atten Defic Hyperact Disord. 2010. Thome J, Jacobs KA. Attention deficit hyperactivity disorder (ADHD) in a 19th century children’s book. Eur Psychiatry. 2004. Gross MD. Origin of stimulant use for treatment of attention deficit disorder. Am J Psychiatry. 1995. Charles Bradley, M.D., 1902–1979. Images in Psychiatry. Am J Psychiatry 1998. Bradley C. The behavior of children receiving benzedrine. Am J Psychiatry. 1937. Myers RL. Methylphenidate. In The 100 Most Important Chemical Compounds: A Reference Guide. Greenwood Publishing Group. 2007.